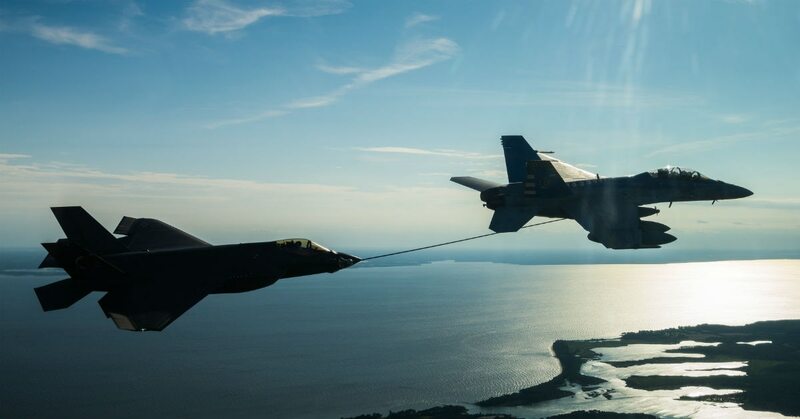 It took place on Aug. 22, when an F-35C from the “Rough Raiders” of Strike Fighter Squadron 125 was being refueled in-flight by a F/A-18F Super Hornet operating from the aircraft carrier Abraham Lincoln, according to Cmdr. Ron Flanders, a spokesman for Naval Air Forces. “During the refueling, part of the refueling basket broke off, and that debris was ingested into the engine of the F-35," he said. The basket is part of the appendage that extends out from the Super Hornet to refuel receiving aircraft, Flanders said. The Super Hornet was flying in front of the F-35 during the mishap, and the broken basket flew right into the fighter’s single engine. No pilots were injured in the incident, Flanders said. Recent integration testing onboard the carrier Lincoln is the first time the naval aviation enterprise is rehearsing as a full band with its newest player. The F-35 was able to safely return to the carrier, while the Super Hornet flew to Naval Air Station Oceana in Virginia. “The fact that the (F-35) was able to return to the carrier is a testament to its survivability,” Flanders said. Its engine will need to be replaced, he said, and the damage will cost roughly $12.7 million to repair. Authorities continue to probe the the accident. Second only to birds getting sucked into jet engines, refueling basket-related incidents are the most common type of engine ingestion mishap, Flanders said. The Defense Department has agreed to "resolve" deficiencies. That's different than "fix." The Navy is working to get the F-35C declared operational by early next year. Although critics have complained about cost overruns, production delays and other snafus dogging the F-35 program, the military services insist that it’s the best strike fighter ever made and will perform well for decades.